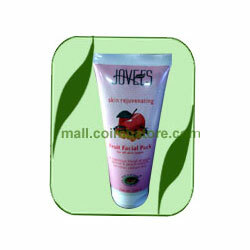 Jovees Skin Rejuvenating Fruit Facial Pack contains a nutritious blend of Apple Extract, Peach Extract, Apricot along with other precious botanical extracts and nutritious blend of fruit extracts that help to improve skin texture, rejuvenate skin & give it a clear, radiant & fresh look skin. Apply all over face and neck. Leave on for 20 Minutes. Wash throughly with plain water.Use twice a week.